Helen Hokinson was a cartoonist with a gift for capturing stout, somewhat clueless affluent matrons who prevail by dint of (sometimes dotty) persistence. She studied at what became the School of the Art Institute of Chicago (then the Academy of Fine Arts) and later secured dependable freelancer status at Marshall Fields and Carson Pirie Scott, department stores in Chicago. She shared a studio with Alice Harvey (later Ramsey), with whom she moved to New York in 1920. She established a new fashion clientele with clients like Lord and Taylor, and supplemented that work with an emerging enterprise, cartooning–which after all, is a cousin of fashion illustration anyway. She caught on with Life, in those days a humor magazine–as opposed to the photojournalism venue it would become, one bankruptcy down the road. Whenever she went out, Hokinson carried a sketchbook, noting small, specific moments of people’s lives she observed around her. This journalistic sensibility for documenting behavior propelled her career as a cartoonist. At the suggestion of friends and a teacher, the painter Howard Giles, Helen submitted a batch of cartoons to Harold Ross, editor of the New Yorker. She had been told that Ross was looking for work like hers, and it turned out to be true. Hokinson became one of the first cartoonists published in The New Yorker, and subsequently enjoyed a lifelong relationship with the publication. At least one of her cartoons ran in every issue until 1950. She specialized in dimly self-confident women of a certain age–to say nothing of a certain gravity–who gamely blunder through modern urban life. Hokinson referred to these comical figures as “My Best Girls." 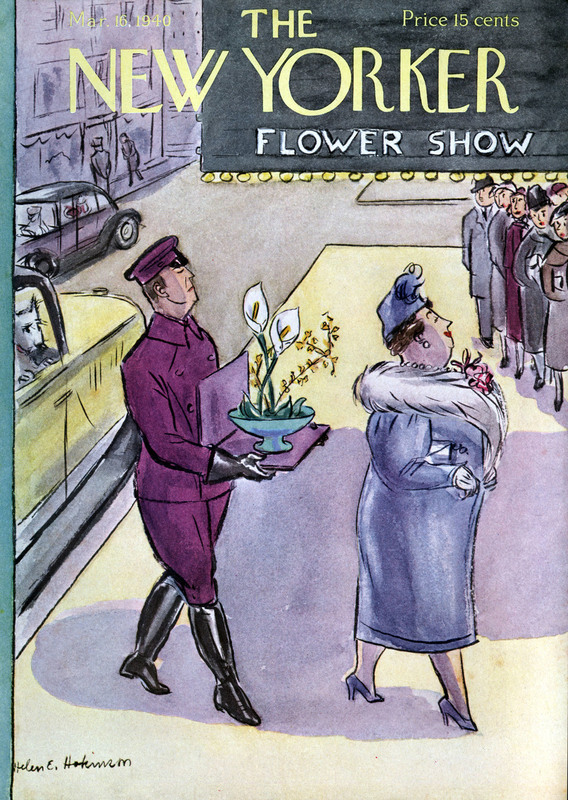 At first her cartoons ran without captions, but soon the magazine assigned a copywriter to write the little bits of dialogue we associate with New Yorker cartoons today. Later Hokinson began a professional partnership with the writer James Reid Parker, who collaborated with her to craft the best words to accompany her pictures. Helen Hokinson accepted an invitation to speak to a charitable concern in Washington DC in November 1949. In the process of traveling to the engagement, the plane in which she was a passenger collided with another aircraft over Washington National Airport. All aboard both planes were killed. Her New Yorker work was compiled and published in book form many times, including several volumes published after her death. Helen E. Hokinson, Cover Illustration for The New Yorker. September 19, 1942. Helen E. Hokinson, Cover Illustration for The New Yorker. March 16, 1940. Helen E. Hokinson, Cover Illustration for The New Yorker. May16, 1942. Helen E. Hokinson, Cover Illustration for The New Yorker. September 25, 1943.